The first air mail Newfoundland stamps tell the story of some of the earliest pioneering flights that attempted to cross the Atlantic Ocean, and today, they are among the World's greatest philatelic rarities. 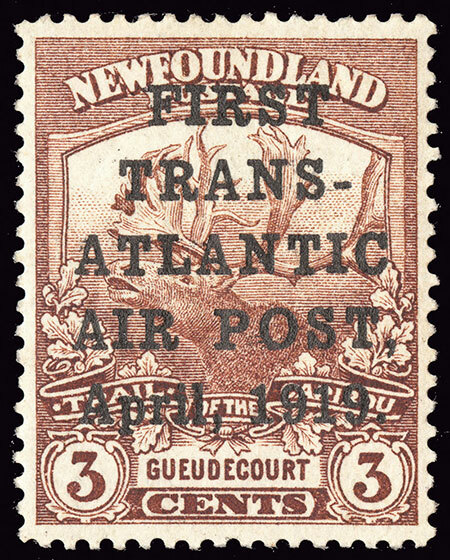 Newfoundland was one of the early leaders in the pioneering of trans-Atlantic flight during the early 20th Century, and they were also the first British colony to issue air mail postage stamps. As a matter of fact, the master of the British Empire, Great Britain, has NEVER officially issued an air mail stamp. It makes a lot of sense that St. John's, Newfoundland would be the focus of early attempts at crossing the ocean by aircraft. Without delving too deeply into geometry, this is the case ... On a globe, the longitudinal lines are much closer together at the poles, than they are in the middle, thus the circumnavigation distance is much shorter. The location of Newfoundland, being at a very high latitude in the Northern Hemisphere, is ideal, as the distance to major European cities is not as far as it would be at lower latitude locations. The following chart reflects the differences in air-miles between London / Rome and Newfoundland and other North American destinations. In looking at a World map, it is instantly obvious that Eastern Newfoundland Island is the closest point in North America to Great Britain and Europe. The 3 C. denomination Trail of the Caribou Series stamp shown above (Scott #C1) was overprinted and issued on April 12, 1919 . 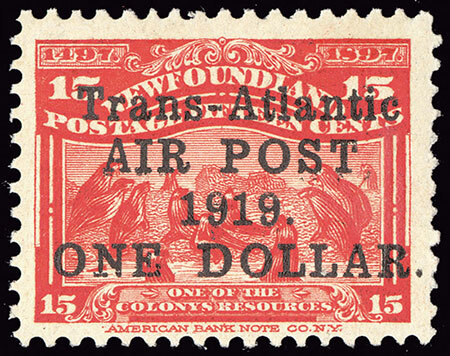 The overprint reads, "FIRST / TRANS- / ATLANTIC / AIR POST / April, 1919". An uncut sheet of 200 Newfoundland stamps was overprinted, and the postmaster, J. A. Robinson, signed his initials on the back of each of the stamps. About 85 mint condition examples exist today. A nice example will set the average collector back about the price of a new Mercedes Benz. Used condition examples are a bit less expensive, but they are still very rare. There were actually multiple trans-Atlantic flight attempts in April 1919, with all of them being unsuccessful. These efforts were partially spurred on by the offer of a very large cash reward. The London Daily Mail newspaper offered a prize of ₤10,000 to the first aviator that completed a trans-Atlantic flight in under 72 continuous hours. The first trans-Atlantic flight attempt from Newfoundland by Lt. Harry George Hawker (pilot) and Lt. Cmdr. Kenneth McKenzie Grieve (navigator), for which the stamp shown above was issued, is the most noteworthy. Today, this air mail stamp is referred to by philatelists as the Hawker Issue of Newfoundland. 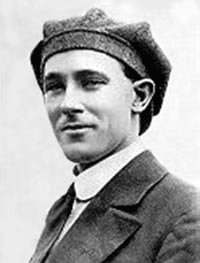 Harry George Hawker was an Australian-born aviation pioneer. He went to work for Sopwith Aviation in 1912, eventually becoming their chief test pilot, and he was also involved in the design of many of their aircraft. After World War I, when Sopwith Aviation went out-of-business, he co-founded Hawker Aircraft Ltd., the company that would later be responsible for many successful British aircraft. Harry Hawker died in a crash, while taking part in an aerial derby, on June 12, 1921. The plane used by Hawker and Grieve was a single-engine Sopwith biplane, based on the design of the Sopwith B-1, a bomber used during World War I. The main section of this modified Sopwith plane was designed to be used as a boat, just in case they ran into trouble over water. 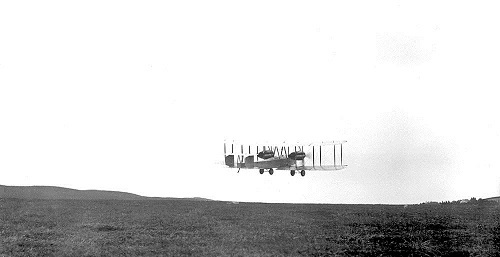 Hawker and Grieve took off from a field in Mount Pearl, Newfoundland on May 18, 1919. About 14 hours into the flight, the engine overheated, and they had to make a forced landing in the Atlantic Ocean. The flight crew were rescued by a Danish merchant ship. They were then transferred to the H.M.S. Woolston and then the H.M.S. Revenge for the remainder of their trip to England. Several weeks later, the body of the aircraft and its mailbag were recovered in the ocean. The mail from the flight was processed, once it arrived in England. On May 28, 1919, Hawker and Grieve were received by King George V at Buckingham Palace, were they were both awarded the Air Force Cross for valor. The London Daily Mail also awarded them a ₤5,000 consolation prize for their valiant attempt. Shortly after the Hawker - Grieve flight left Newfoundland, another flight was attempted. Frederick Raynham and C.F.W. Morgan attempted another trans-Atlantic flight on May 18, 1919. 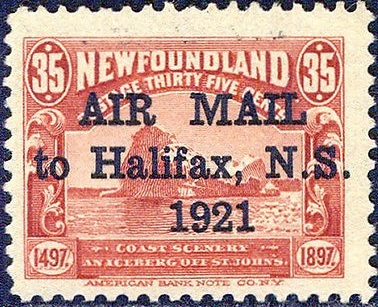 Newfoundland stamps were also prepared for this flight in April 1919. W. C. Campbell, the secretary of the Postal Department, hand-overprinted 182 Trail of the Caribou Newfoundland stamps with "Aerial Atlantic Mail" in script. J. A. Robertson, the Postmaster, added his initials underneath. An example is shown above (Sc. #C1a). The Raynham - Morgan flight took off from Quidi Vidi, Newfoundland, traveled a few hundred yards, and then crashed into the ocean. Another attempt was made in July, with the same results. The mail from these flights was recovered and transported to England by ship. Letters with these manuscript overprints arrived safely in England, but the contents of the mail bags had been damaged by water. As a result, many of the Newfoundland stamps had floated off the envelopes. As these manuscript overprints are only able to be authenticated when tied to cover, existing examples of these Newfoundland stamps on cover are tremendously rare today. The scan above is cropped from a cover that was offered in a major Spink auction sale, where it sold for $21,000. Only about 16 covers are known. The 15 C. denomination pictorial definitive stamp of 1897 was overprinted, revalued, and issued as an air mail stamp (Scott #C2) on June 9, 1919 . The overprint reads, "Trans-Atlantic / AIR POST, / 1919. / ONE DOLLAR." This air mail stamp was issued for mail carried on the June 14, 1919 trans-Atlantic flight attempt of John Alcock and Arthur Brown. Compared with the April 1919 Hawker Issue, these Newfoundland stamps are very affordable, even on flight covers. There are several varieties of these stamps, having to do with the alignment of the overprint and the punctuation marks. The error with the missing comma after POST is shown in the scan above (Sc. #C2a). These Newfoundland stamps were also used for air mail carried on other flights, as well. The aircraft used for this flight was a Vickers Vimy (bomber) biplane. It doesn't look quite as sturdy as the Sopwith aircraft flown by Hawker and Grieve two months earlier, but it was a twin-engine aircraft, which may have played a major role in its eventual success. Sir John William Alcock, KBE, DSC (1892-1919) was a Captain in the Royal Naval Air Service and the Royal Air Force during World War I. He was killed in a flight accident, in route to the Paris Aeronautical Exposition, in December 1919. Sir Arthur Whitten Brown, KBE (1886-1948) served in the Royal Air Force during both World War I and World War II, eventually achieving the rank of Lieutenant Colonel. 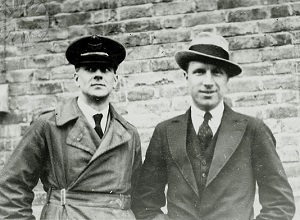 After World War I, he applied for a job at Vickers Ltd. As a consequence to his employment, he was asked if he would be the navigator for a proposed trans-Atlantic flight, partnering with John Alcock, who had already been chosen as the pilot. Early in the afternoon of June 14, 1919, the modified Vickers Vimy aircraft, with Alcock and Brown, took off from Lester's Field, St. John's, Newfoundland. About 16 hours later, early in the morning of June 15, 1919, the aircraft touched down at Clifden, County Galway, Ireland, being the first non-stop flight to successfully cross the Atlantic Ocean. A few days later, Alcock and Brown were received at Buckingham Palace, where they were both knighted by King George V. They were also awarded the honor of Knight Commander of the Most Excellent Order of the British Empire (KBE). The air mail stamp shown above (Sc. #C3) was issued on November 7, 1921 for the Experimental Air Mail Service between Botwood, Newfoundland and Halifax, Nova Scotia. Thirty-five Cent denomination Newfoundland stamps of 1897 were overprinted: "AIR MAIL / to Halifax, N.S. / 1921". It is stated that 14,000 of these stamps were printed but that only about 5,000 of them were actually used. This proposed air mail service was not successful, and most of the air mail letters were eventually forwarded to Nova Scotia by ship. There are many varieties of these overprinted Newfoundland stamps, including ones with inverted overprints. Please see the specialized catalogs for details. The air mail stamp shown above (Scott #C4) was issued on May 21, 1927 for the non-stop seaplane Flight of Francesco De Pinedo from Newfoundland to Italy. 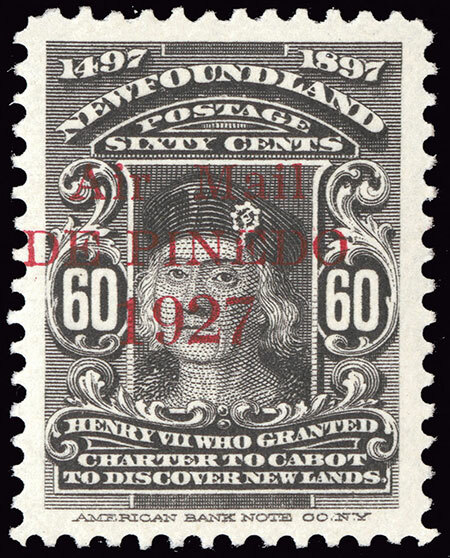 Sixty Cent denomination Newfoundland stamps of 1897 were overprinted: "Air Mail / DE PINEDO / 1927". Francesco De Pinedo (1890-1933) was a famous Italian aviator of the time. By 1927, he had flown most of the globe in his double-hulled Savoia-Marchetti seaplane named the "Santa Maria II". In May 1927, De Pinedo was on the last leg of his circumnavigation of the Atlantic. The Newfoundland government asked him to carry a mail bag back to Italy for them. He agreed, and the stamp shown above was quickly issued to publicize the event. He took off from Trepassey, Newfoundland on May 23, 1927. During his flight from Newfoundland to Italy, De Pinedo experienced engine trouble and he was forced to land in the ocean. He and his aircraft were found, and they were towed to the Azores. Following repairs to his aircraft, De Pinedo finally completed his flight, and he arrived in Rome on June 1, 1927. Only 300 of these stamps were overprinted, and the few surviving examples of them today are very rare. 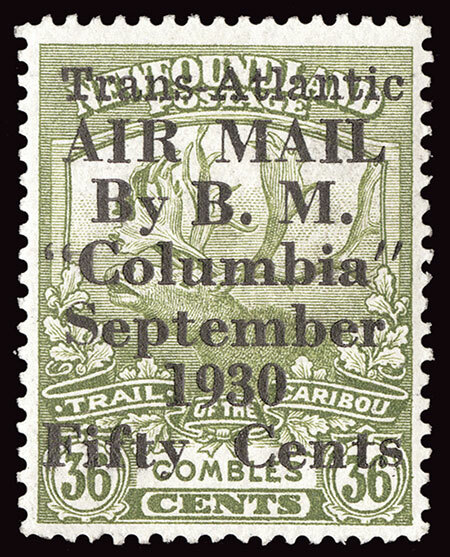 The 36 C. denomination Trail of the Caribou Series stamp shown above (Scott #C5) was overprinted, revalued, and issued on September 25, 1930 for the Trans-Atlantic Flight of the "Miss Columbia" in October 1930. The overprint on these Newfoundland stamps reads, "Trans-Atlantic / AIR MAIL / BY B. M. / "Columbia" / September / 1930 / Fifty Cents". The "Miss Columbia", a Bellanca monoplane, arrived at Harbor Grace, Newfoundland on September 22, 1930 for its planned trans-Atlantic flight. The pilot was Capt. Errol Boyd, and the navigator was Lt. Harry Connor. 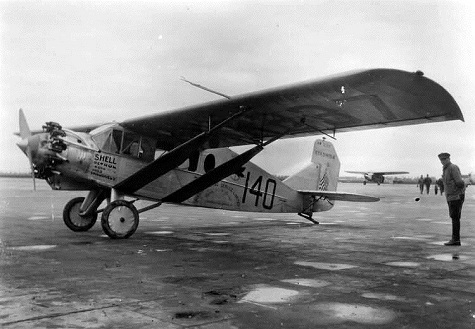 Wright-Bellanca WB-2 -- Named: "Miss Columbia", Later: "Maple Leaf"
The Newfoundland stamps were sold at post offices in both St. Johns and in Harbor Grace. The covers postmarked in St. Johns are dated September 25, 1930, whereas the covers postmarked in Harbor Grace are dated October 9, 1930. Many of the covers were autographed by the pilot and navigator. A total of 300 stamps were printed and sold, with less than half of them being used on flight covers. The very few surviving examples available today are all very rare. The plane took off from Harbor Grace on October 10, 1930, and it reached the Scilly Isles, near Lands End, England on October 11, 1930. The covers carried on the flight were backstamped on October 13, 1930.